Chicas Tacos isn&apos;t your typical taqueria. 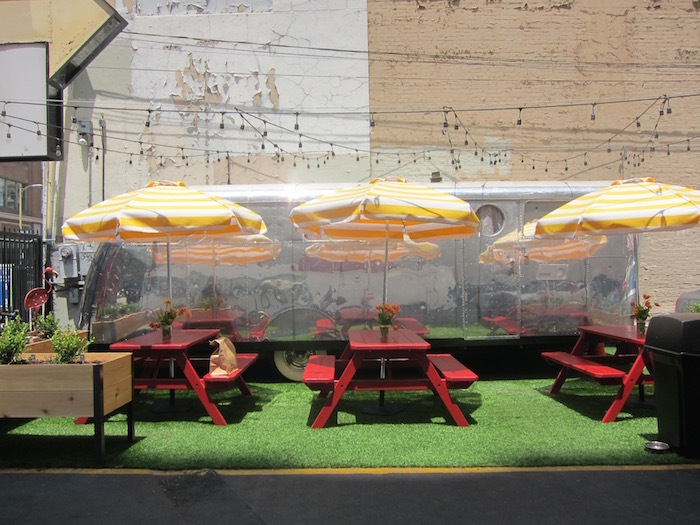 The vibrant taco shop—decked out with Astroturf and red, metallic flamingos—is slinging Baja-inspired tacos with some unique twists. Take, for instance, their fish tacos. Instead of just your regular Ensenada-style, beer-battered fish, Chicas Tacos&apos; tops theirs with a Caesar salad. While it may sound bizarre, it makes for a fitting marriage of flavors and textures. We were invited to stop by and sample the tacos, and found the Caesar salad—with its thin shavings of manchego cheese mixed in the salad—to be just as light and refreshing as the shredded cabbage you normally find in fish tacos. The croutons add a pleasant crunch that complements the deep-fried batter. Chris Blanchard, who co-owns Chicas Tacos with his brother Jon Blanchard, tells LAist that they were inspired to create this dish from their travels to Mexico. They first fell in love with fish tacos when they were kids, when they used to travel to Ensenada with their church to build homes in the area. When they discovered that the Caesar salad is believed to have been invented in Tijuana (yes, really) by a restaurateur named Caesar Cardini, it only made sense to them to meld the classic fish taco from Ensenada with the Caesar salad from Tijuana, two regions that are less than a two-hour drive from each other. "I think it&apos;s a surprise for a lot of people because they&apos;ve never seen those two combinations together, but for us, it was so indicative of the area and the culture and people," Blanchard says. "So, we had to put it together and bring it here for all of us to try in downtown." Chicas Tacos&apos; offerings are mostly inspired by the Blanchard brothers&apos; many trips to Valle de Guadalupe—a community about 15 miles north of Ensenada. (Blanchard compares the vibe of it to Napa in the 1970s.) Originally, they visited the village for its lush wineries, but eventually would keep returning to visit a family they befriended—one that kicked off the relationship by inviting the brothers to their home on their farm for dinner. Now, Blanchard says he and his brother call them family. "We would stay with them and they taught us their styles of cooking and how they believe that everything should be grown from the farm," Blanchard says. He says the family gave the brothers their blessing to bring the recipes back to the United States, and in doing so, they&apos;ve also brought along that farm-to-table mentality from the Valle. Chicas Tacos&apos; produce is organic and non-GMO, their meat free-range and fish wild-caught. One of their other standout tacos is their veggie option, which is a medley of complex flavors and ingredients, like cauliflower "chorizo," marinated mushrooms, avocado sauce, queso panela and chiles. 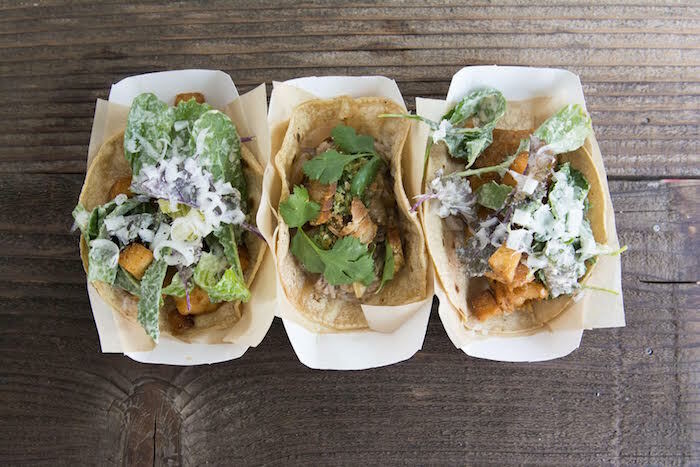 Blanchard says their chicken taco is the "closest representation of the area where all of our recipes are from"—the Valle de Guadalupe—and is the dish that "kick-started this whole Chicas Tacos concept." Like the fish taco, the chicken is accompanied by a salad, but a Baja-Mediterranean one with creamy feta, olives and jalapeño, all mixed together in a tahini sauce. The tacos here run a little higher than your average tacos, at $4.50 a pop, but they are a hefty size and quite filling. 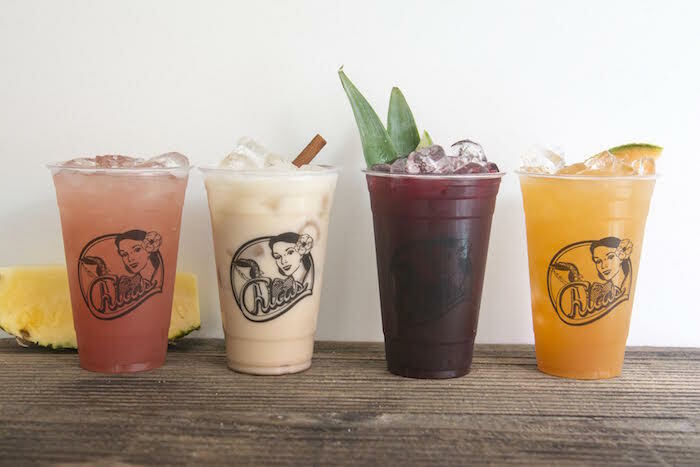 If you need something to cool you down—which you might after trying out their six different kinds of salsas—you can order their agua frescas with flavors like watermelon cinnamon or lavender cantaloupe, or just straight-up coconut juice right out of a whole coconut shell. While the tiny, 700-foot restaurant is bright and cheery with its teal-bordered windows, and pink-and-white swirly tiles that were imported from Mexico, it would be amiss to not dine outside on the patio. The red picnic tables are shaded by adorable yellow-and-white umbrellas and vases full of tulips. It&apos;s all set against a backdrop of a chrome 1947 Spartan—a mobile home that looks akin to a vintage Airstream—that the brothers bought from the family in the Valle. And don&apos;t be afraid that you&apos;ll drive past the taqueria and miss it—a retro neon "Chicas Tacos" sign with a scarlet arrow will point you in the right direction. 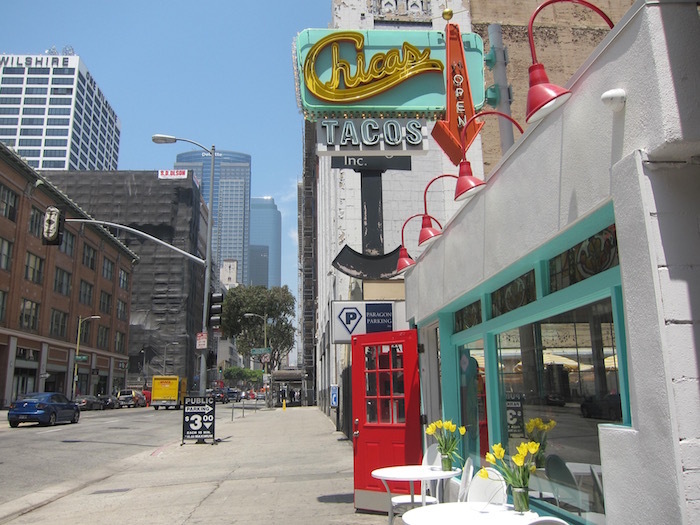 Chicas Tacos is located at 728 S Olive St., downtown L.A., (213) 896-0373.